Heading to the store to prepare for the upcoming holidays? Make sure that you don’t forget to include Scott®ComfortPlus Toilet Paper on your shopping list! From crazy schedules, to parties, to guests galore, keeping Scott®Toilet Paper on-hand is key to surviving this busy holiday season. If you used to purchase Scott® Extra Soft, Scott ComfortPlus is the new and improved version! NEW Scott ComfortPlus Toilet Paper is the only bath tissue designed to care for you with everyday comfort, plus a little extra. With thick and plush sheets for a trusted, comforting clean, Scott Toilet Paper is tested for strength and designed for comfort. Scott ComfortPlus is preferred over Angel Soft (vs. Angel Soft® Double Roll) and is 5 in 1 – soft, strong, thick, absorbent, and clog-free! 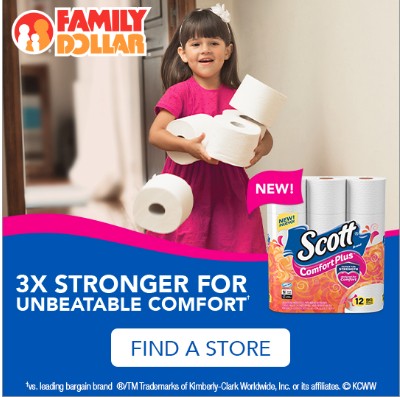 For a limited time, save $0.50 on Scott ComfortPlus 12 ct. Big Roll at Family Dollar! Click here to check out these great savings, and enjoy everyday comfort all season long! And don’t forget to click here or on the image below to find your closest Family Dollar store!